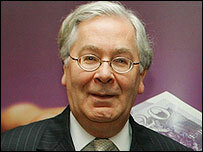 The Governor of the Bank of England, Mervyn King, has told the BBC he wishes mortgage costs were part of the official inflation target. They represent the biggest expense for many households, but are not included in the Consumer Prices Index (CPI). Mr King acknowledges the omission is "controversial" and causes "particular difficulty" for the Bank. His comments come as economists debate whether interest rates should rise again to keep inflation in check. The Monetary Policy Committee's task is ensure the CPI stays within range of 2%, a target set by the government. In the past year, the committee has increased interest rates five times to 5.75%, the highest level since 2001. However, fears about inflation persist. The CPI fell to 2.4% in June, official figures show. But at the same time, the more familiar Retail Prices Index, which does take mortgage costs into account, rose to 4.4%. Some critics fear the CPI may not reflect the true cost of living and that could mean interest rates are still not high enough to keep inflation properly under control. Speaking to BBC Radio 4's Inside Money programme, Mervyn King said the CPI is a broad measure of a representative sample of goods and services. However, he admitted the absence of mortgage costs is "surprising". "Some of these issues are controversial. I wish it did include housing, but it doesn't - at least at present. Maybe one day it will," he said. The reason, he explained, is because of the way the index has been designed. "CPI is meant to be constructed in the same manner in all European countries, and so far the European statisticians have not worked out a way of how they can calculate the cost of housing in a way that can be done uniformly across Europe," he said. Overall Mr King defended the performance of the Monetary Policy Committee since its inception in 1997. "The track record is pretty good, so if we have made wrong decisions from time to time, there can't have been very many of them and they can't have been that wrong," he said. "The Monetary Policy Committee I think was well designed," he added. "I think it's been successful for 10 years and I see no reason to believe that it cannot be successful for another 10 years and decades after that." BBC Radio 4's Inside Money: The Cost of Living will be broadcast on Saturday, 21 July 2007, at 1204 BST. A longer version of the programme was broadcast on Monday, 23 July 2007, at 1502 BST.